I remember as a young child the excitement of holding a living creature in my hands. The best was holding my newborn younger brother and sisters when my Mother came home from the hospital. Even catching an insect for the first time with my hands and looking carefully at the intricate design of God’s handiwork was a thrill. The deception that life is in our hands and we can do as we wish with it goes way back — to Cain. It’s a powerful deception that led to countless murders in every century. In previous centuries, wars and genocide accounted for most deaths by human hands. In our lifetime, abortion is by far the greatest means of killing human life. Job was under no illusion that life is simply in human hands. He reminds us that the life and breath of “every living thing” is in God’s hands. He sarcastically tells his friends that even the beasts, birds, bushes, and fish know this. 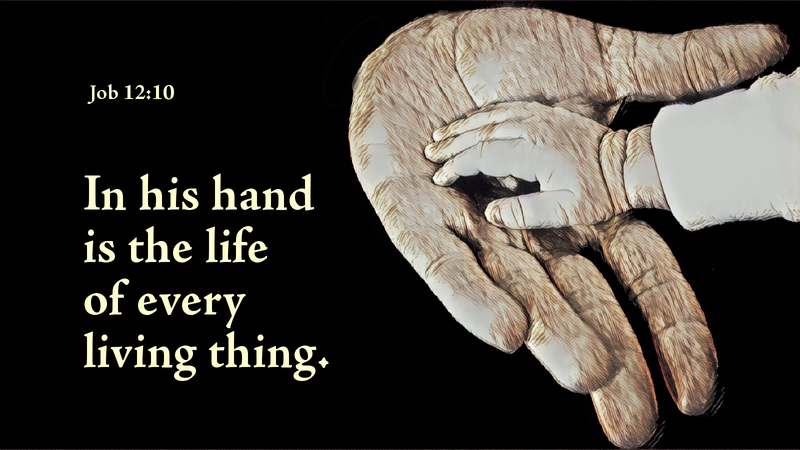 The rest of creation knows in whose hands they rest, and upon whose hands they are totally dependent for life and breath. Human creatures, the crown of God’s handiwork, who should know better than every other creature, are the most deceived and in the dark. Prayer: Dear heavenly Father, deliver us from the deadly deception that life is in our hands to do with as we wish. Make us ever aware that all life is a gift from you, and that when you place life in our hands, you call us to preserve and nurture that life. We pray this especially for the sake of all the unborn children you have entrusted in our hands. Amen. Today’s devotion was written by Pastor Mark Chavez, General Secretary of the North American Lutheran Church. If it’s possible to get these emailed daily, please add my address. I don’t have an NALC near me now but I follow it in hopes one day I will! Best thing to do is join our NALC Life Ministries page on Facebook..is that a possibility? Beautiful, poignant and powerful thoughts, Mark, to kick off this series.